MISS SIXTY HIGH BINKY BLUE DENIM JEANS-LABEL SIZE 28--MEASURED WAIST 32" LEG 32"
DARK BLUE MISS SIXTY JEANS--SIZE 28. Length: 103cm. Materia: 100% Cotton. There is a deep oxblood red band down the centre front and back legs which creates a striking yet subtle effect like paint has spilt! It may be slightly darker than photo but in order to make the finish apparent, I had to lighten the photo. MISS SIXTY Blue Denim Skinny/Slim Jeans Style High Binky Women's Size 27. Condition is Used. Dispatched with Royal Mail 2nd Class. Miss sixty high binky dark blue skinny jeans. size 29 waist and 32 inside leg. Size 14 - 32W 30L. Grey Skinny Jeans Jeans. 5 Pocket Jeans. Waist is 24", leg length is 32", with 3 front & 2 back pockets, top of waist to crotch is 12". Good used condition. Length: 100cm. Materia: 100% Cotton. 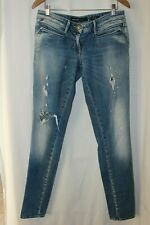 MISS SIXTY Ladies Denim Blue “High Binky” Jeans Skinny Size 26 Waist. Inside leg 33 inch. Please note the button on front is meant to have a “bite” out of it. It’s not broken. These beautiful high rise skinny fit jeans are a perfect pair for any occasion but the delicate glitter makes them particularly good as a nightwear! I’m 160cm tall and the trousers end around my ankle. Wash L00U70. Size W27 L36. Inside leg L36". BNWT but with missing top press stud and two tiny faint marks, one on the outside seam of the right leg near the knee and other, very faint, on the bottom part of the seat area on the right hand side. High waisted. New Miss Sixty Crew jeans. Size 26" waist and 34" leg. 100% Authentic. 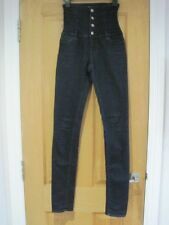 Women's MISS SIXTY indigo ultra high waisted skinny jeans size UK 6 RRP £129.. Style: High Binky. Wash: Dark Wash. Zipper Length: 3.5 ". MISS SIXTY. MADE IN ITALY. OPENING 11". FRONT RISE 7".